Please send any Harriers news or results to news@ilkleyharriers.org.uk for this web site and for the Ilkley Gazette. Caroline Howe for getting teams together for the Yorkshire and Northern road relays together with Istvan Jasco as well as Caroline individually for work on these relays for the club this month. From Jonathan Turner ... Nathan Edmondson was an unlucky second in the Guiseley Gallop on Easter Sunday. Leading the way on the second circuit, he was momentarily sent the wrong way with just over a kilometre to go when lapping runners and suddenly found himself pushed from first place to a minute behind. A great recovery put him right back in the mix but it was too much of a deficit to bridge in such a short space of time, and he had to settle for second, 21 seconds behind winner Matthew Hallam of Valley Striders. From Nick Helliwell ... David Foyston and I ran the inaugural Newlands Memorial race on Saturday, which used to be called the Anniversary Waltz. It was a baking hot day, brilliant for views, terrible for running 19km over the Lakeland fells. Still, run it we did, and in retrospect we enjoyed it, though it was hard to feel that way with 2,000ft of near-vertical Robinson in front of you, on the hottest day of the year. We couldn't carry enough water, as our bags were packed with full body cover, hat and gloves (! ), but both of us made it to the end and are able to laugh about it now, with tears running down our faces... How hard can 19km be?? Plenty of Harriers turned up to celebrate the 300th Skipton parkrun, Rachel Carter led them home in ninth overall - the second lady - with a superb sub-20-minutes time on a course which features narrow paths and plenty of momentum-losing turns. A new club ladies record by Jemima, beating the 2014 time of 36:22 by Nicky Green. From Caroline Howe... This was marathon #18 for David (6th Paris) and #5 for me. David has long been a fan of this race, and now I know why... it takes in all the main sights of this beautiful city (it made me laugh that they have signs pointing out the Eiffel Tower! ), the support is fantastic (and at times a bit crazy! ), it's well organised and there is no ballot. It's iconic, with the start and finish on the Champs Elysees, the Arc de Triomphe stunning against the morning's blue skies. We were very lucky with the conditions - crisp and cold but bright. My training for this had not gone to plan due to various interruptions (excuses, excuses!) whereas David, having had a rare 18 months off marathons, got back into the swing, so we suspected our times might end up being quite similar (but heaven forbid we would run it together!) My race went to plan, and I was pleased to keep an even pace throughout, crossing the line in 3:55, and actually enjoying (most of) it! Normal order was restored with David finishing 6 minutes ahead of me in 3:49. A wonderful marathon, highly recommended! From Val Kerr ... A dry but cold day for this year's Skipton triathlon. This was only my second triathlon and I was pleased to finish in only a few minutes slower than last year. The cold gusts of wind during the bike stage were numbing to the legs making the first 1/2 lap of the run quite difficult. However I was happy to eventually get going and overtake a few folk in the process. This is an extremely well organised and firendly triathlon and is great for novices. There were some fantastic results for a number of Harriers spotted amongst the finishers. From Jayne Norman ... The 2nd year the Burnsall Half Marathon event has been run by Due North, and a truly well organised, and well waymarked race, so minimal marshals are needed. A sunny breezy day helped runners keep cool on the day. The figure of eight course was great, with plenty of climbs and descents in and around the Wharfe Valley. From Geoff Howard ... The event optimises your chances of a good time having a flat and smooth surface with no sharp bends and a field of only about fifty so I was pleased to run my second best time in three years reducing the club v75 record. From Will Buckton ... The LDWA's 23.8 mile route covers a variety of terrain and passes Fewston and Swinsty Reservoirs, Bolton Abbey, Beamsley Beacon, Round Hill and Timble. The ground was drier than my two previous attempts and I finished 10th in 3h27 out of 197 runners and walkers. From Sue Williamson ... Lucy beat her PB by 29 minutes 43 seconds. From Hilda Coulsey... I ventured to the Northumberland coast on Sunday to run this well sponsored and supported 10k. This was my first excursion in a British Masters AF event which was delightfully friendly (BMAF chose to join this local event for their annual road 10k). I was slightly intimidated as the convention is, in these BM events, to wear your age category as a target on your back but it amused me that it seemed to be younger runners chasing, I didn't see a single V65 during the race at all! The age category winners posted astoundingly good times. The race itself was flattish along the coast, a few sand dune bumps and back along a main road footpath. It was very misty hence any potential sea views were not visible. From Jim Ryder... I took an opportunity to enter the Toronto MEC 10k race in Canada. One of a series of races organised by the Mountain Equipment Company - a great outdoor shop/co-op across Canada. A rare road race for me - I think only my 5th 10k. It was a friendly low key event, with options of 5k, 10k and half marathon which encouraged a wide range of entries and a good atmosphere. It was out and back along the lakeshore, pretty flat with a strong initial tailwind - so faster out than back. As well as the seniors below, many juniors running, helping Ilkley to first ladies' team. Euan Brennan represented Great Britain and Northern Ireland in the men's under-20 event at Aarhus, Denmark. The race was won by Ethiopia's Milkesa Mengesha in 23:52: Euan finished 50th in 26:55, 3rd Brit, helping his team to 8th place, the first of the European teams. See him on BBC catchup, the U20 race starts at about 1h50 in. From Caroline Howe and Istvan Jacso ... The ladies managed to field 3 teams, made possible by some last minute stand-ins (thanks Kate and Jayne!) And what a result by our A team of Kate, Rachel, Beth and Sally A who all went well under 20 mins, and finished in bronze medal position, out of 35 teams!! Great performances too in both the B and C teams, to finish 19th and 27th respectively. There were a number of impressive PB and SB-pace runs across all teams (a shame the course was just short of 5k! ), with the team dimension seeming to spur everyone on to perform at their best. The team spirit was fantastic, with lots of cheering each other on round the track. In total 15 IH ladies have taken part in either the Northerns or Yorkshires in the past week, and it is really great to see such enthusiasm for these sorts of events and hopefully something we can continue and build on in future years!! This year we were able to enter two mens teams, so together with the three womens teams, it was a great turnout by the Harriers at the Brownlee Centre. Some of us were slightly surprised that the circuit, known about runners posting fast 5k times on it has a "hill" and it's not completely flat. I think by the end of the day we all proved that this is still indeed a fast course despite that, as most of us posted unofficial 5k PB times, however the distance of each legs were officially 4.8k. It was Nathan and Steve who started the race, both were benefiting slightly from running with others around them which was helpful in the windier parts of the course. Both of them gave an amazing start for the two teams in 9th and 40th place. Next ones were Dave and Colin who both said that the third lap was pretty tough! Third runners were Nick and Mark completing the changeover in 24th and 42nd place. Bringing home the virtual baton were Istvan and Mike. Istvan nearly missed the changeover while Mike experienced a bit of fatigue after a recent 5k. At the end, team A finished 17th and team B came home in 39th out of 49 teams who completed the race which is a solid result and we all enjoyed the day! From Brian Melia... I ventured up to Askham, near Penrith for the start of this 42 mile Lakes Mountain race, run by Joe Faulkner. Super friendly with lots of good runners. It runs over Loadpot up to High Street on beautiful grassy tracks. Then by Angle tarn down to George Starkey hut, for refreshments. There was a great crew of helpers. I ran most of the day with a friend Matt Neale, who helped with my Joss Naylor. We continued over to Wythburn church via Grisedale tarn with Tom Hollins tagging on. This is the same checkpoint as on the Old County tops. The only problem was we needed to ascend up to Helvellyn, which is some climb. I had sore feet and was a little tired so dropped behind on the climb. Only to be caught by another good friend. We ran over to Whiteside then back to George Starkey where I needed a rest as feet annoying me. It is then just a pleasant trot back over Place Fell and back under the hills to Askham for lovely homemade soup and tea ... .A perfect day in the mountains ... apart being a little slow. Finished 10hours 11 minutes in 64th place. From Caroline Howe ... It was a bright, sunny, breezy day in Birkenhead for the Northern Road Relays, at which the Club managed to field two teams. It had been touch-and-go as to whether this would be the case, so many thanks to the late joiners Jayne and Tracey who ensured we were able to make up a second team! The race consisted of two longer legs of 8k and four shorter legs of 4k, all around the pretty Birkenhead Park. Apart from the first leg, the field is fairly spread out, with the men's and women's races taking place at the same time, so it feels a bit like a parkrun. The atmosphere was very relaxed and sociable, with those who had already run or waiting to run able to enjoy spectating. So it had a real 'day out' feel! For most of us this was our first experience of this sort of event, and it was a great way to meet some new faces while representing the club at what is a prestigious, championship event with a very high quality field. Our A team performed spectacularly, finishing in 14th position out of 64 teams in total (54 of which completed the race) - equalling the highest position the club has ever achieved at these championships, and with very fast individual performances. The B team finished in a respectable 42nd place, again, with everyone putting in great individual times. But most importantly, we all enjoyed the day immensely and are keen to return! These events really are open to everyone - from the top class runners, to those who simply want to challenge themselves in a team environment over an unfamiliar distance. I urge everyone to consider joining us next time! From Petra Bijsterveld ... Hilda and I were the only Harriers today at the 'Wilmslow Festival of Running' which incorporates a half marathon, a 10K, and fun runs for the juniors. I had run the 2018 version with 'bonus' heat (it had been moved to June due to snow in March), this year the race was back in its normal slot and we had excellent running weather, cool with sunshine and a manageable breeze. It's a good, traffic free course which goes through pleasant suburban countryside and many locals come out to offer support. Impeccably organized with a fab medal there really is nothing to dislike. The obvious downside is that you have to run 13.1 miles. I had no particular expectations regarding time, though I hung around the 2 hour pacer until about half way. Then the legs started to complain rather loudly, not helped by there being rather more uphill in the second half. I slowed quite a bit but was pleased to at least not walk. Hilda did rather better and managed to set a new FV65 club record for the HM distance, knocking more than 6 minutes off the previous record which had been held by Margot Dale since 2007. From Alison Weston ... A brilliant performance from Kate Archer in this classic skyline race - 4th lady, 1st LV40 and a PB by well over 30 minutes! I got round the 21 miles as 2LV50 but it felt very hard and a long way behind Kate! A new record this year by Carl Bell. From Colin Williams... On Saturday afternoon I took part in the Yorkshire Cakeathon, a race that you can run as many 6.55 mile laps in 6 hours and you get to eat a piece of cake after each lap, hence the name. I started off well, but after 4 laps (26.4 miles) I was done in and decided to stop. A race for those who like cake, I find it difficult to eat during a race, but enjoyed in after I finished. From Helen Waddington ... So many incredible performances despite the inclement weather. A great turnout for this League counter - PBs, Sub-40 first-timers, high category placings and an amazing and what I assume must be a new V75 Club record from Geoff Howard who cruised past me around mile 4. From Pete Shields ... Well done to Geoff Howard who is top of the GB Rankings for the MV75 10k after this result. From Dave Woodhead ... Euan Brennan has been named in the British Team for the IAAF World XC Championships in Aarhus, Denmark, later this month. Info. 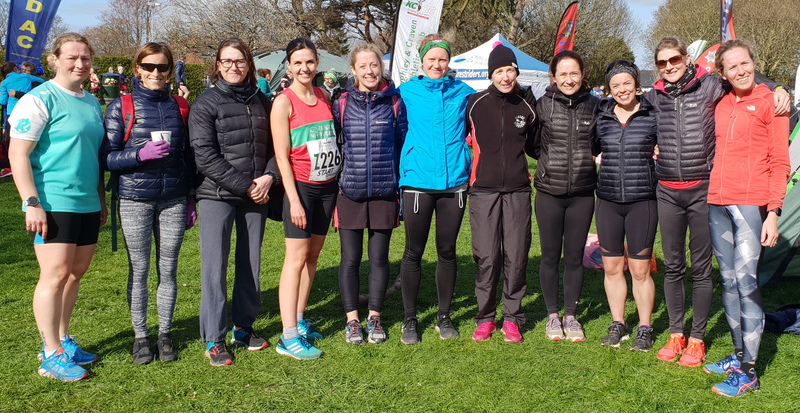 From Jane McCarthy ... A great start in the 2019 Harriers League with nearly 40 runners enjoying either the Meltham 10K, Harewood Half Marathon or Ilkley Fell Race. Steve Newell tops the table after declaring his Wildcard from the Cambridge Half Marathon. Well Done Steve! But not far behind and having run one race less is Kate Archer, her Wildcard coming from her win at the Rombalds Stride and earning her an impressive 105 points for the League. League winner from 2018 Colin Williams is in third place. Jack Cummings has started his Fell League campaign with another maximum 100 points from his fantastic win at the Ilkley Fell Race. 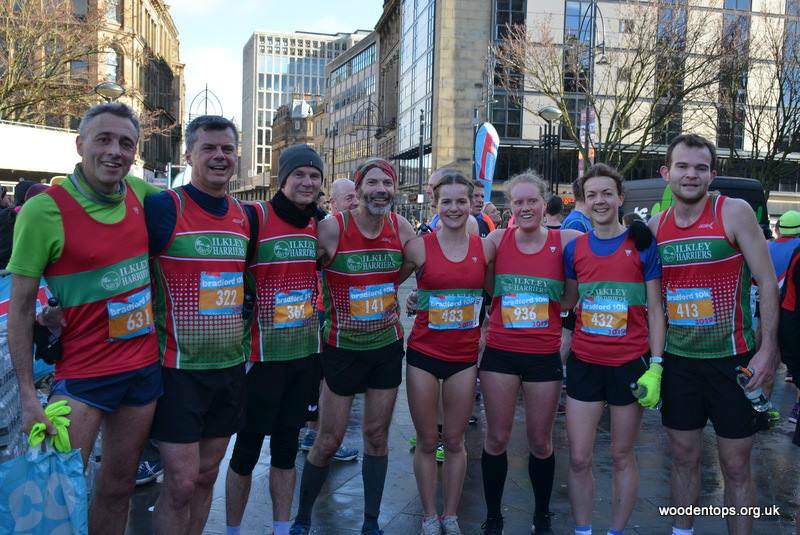 The next League Race is the Bradford 10K on Sunday 17th March. Please note that all races are now confirmed (see League page) and include Evensplits 5K on 24th April, John Carr Trail Race 1 on 1 May (open for entries on RaceBest now) and Harrogate & District Summer Road League (HDSRL) race 3 on 20th June at Yeadon (Dragons Running Club) - details and HDSRL entry on the HDSRL website. From Michael Abrams-Cohen ... Flying the flag for Ilkley at the Spenborough 20 Mile - starting on the Queen Mary's track before heading out on two 10 mile laps. All weather was experienced - starting with rain, then sleet and snow before finishing with glorious sunshine. With 1500ft elevation, it was the perfect practice for London. From Colin Williams ... On Saturday I took part in my first Haworth Hobble along with another Harrier Adela Reperecki, we experienced all of the weathers in one day starting in the rain, but got hail and sunshine too, but the hardest to cope with was the strong, strength sapping, head wind, which we ran into for the first 10 miles or so. The very hilly 32 mile route with over 5,000 ft. of climb (according to my Garmin) I found to be a tough run under those conditions. From Petra Bijsterveld ... This week Oscar Stapleton was first finisher at Riverside (Chester-le-Street) and closer to home Rachel Carter was first woman home at Skipton. Mark Mon-Williams flew the Harriers flag at a rather small parkrun in Toulouse. Numbers wise the inaugural parkrun in Centre Vale park in Todmorden was a huge success, with almost 200 people turning out on an unpleasant day weather-wise. Our own Will Worboys has been instrumental in setting this new parkrun up, well done Will! From Geoff Howard... The Fountains Abbey Park Run was abandoned today because of a 'major medical incident' namely that one of the runners (called Paul) had had a cardiac arrest within minutes of the start. I was stopped after 8m 10s which in retrospect I estimated must have been about as far away from the incident as it was possible to be. This indicates just how quickly a marshal, spectator or competitor had managed to contact the Run Director, who having made the decision to abort the event, had then contacted other marshals including the one who stopped me. This evening I received a copy of a message from Paul's wife which said that "Paul was in Harrogate Cardiac Unit and things were looking good, adding that the swift action taken had saved his life". It served to remind me that marshalling isn't just a matter of being a human signpost. From Geoffrey Howard ... The inaugural Brownlee Centre Festival of Running was held on Sunday just after the previous night's strong winds had fortunately almost gone. It had an ambitious programme of five events from one mile to twenty miles all run round the Centre's one mile cycle track (with all entry fees going to a Leeds University overseas charity). The fields weren't large with many not belonging to a club although most events were won in impressive times. In the 5k it must be the first time I've run against more than four times as many women (32) than men (7). The winner was Martin Roscoe (Leeds City) in 18m 59s and, although I was third, my time of 22m 34s was 18s slower than at Horton Park Run (which has more than twice the ascent) three weeks ago. Maybe upping to v75 in the meantime has taken a toll. The whole event had a Park Run feeling from the excellent organisation (e.g. results on the RunBritain website within a couple of hours) to the participation of a wide range of abilities (including some very young children in the mile). I hope it will, and expect it to, prosper. From Hilda Coulsey ... Geoff's time is a new V75 club recoprd. From Steve Newell ... After the pain of the moor and the hills, it was lovely to get onto nice, flat roads for the Cambridge half marathon. It is a lovely course, going through the centre of the city and past a number of the iconic colleges, before heading into the Cambridgeshire countryside, through Grantchester and back into the city. Lots of support and entertainment along the way helped to make this one of my favourite half marathons. It is a very popular event with an entry limit of 10,000. From Jayne Norman ... Described as a hilly road marathon, Its grim up North Running organised a superb event. An out and back course - so you knew the hills you had to return on! A few Harriers attended the race. For myself the thought of homemade cake at the end got me through the tough middle section. My half marathon PB was gained on the course, by a whole minute. From Sue Williamson ... Starting on the Menai Suspension bridge I was the only Harrier taking part in the Anglesey 10K. Through wind and rain I was happy to finish in the time of 54:58. Great encouragement from a large crowd with nice views. From Jean Sullivan ... This 10km race is held in Accrington, Lancashire, birthplace of the famous athlete Ron Hill. Unfortunately he was too unwell to attend today's event. Organised by Cannonball Events, this well-organised and friendly 10km race starts at Accrington's impressive Town Hall, is largely on road, apart from a 2-mile section on the old train line between Haslingden and Accrington which is now used as a cycle track. By mile 4 the climbing is complete and the flat and then downhill finish was very welcome! I was particularly impressed by the appearance of provisional results via 'live timing' on a large leader board within seconds of crossing the finishing line! From Jim Ryder...Two Harriers in a top quality field for the Stan Bradshaw Pendle Round from Barley, 9.3 miles, 1936 feet. From Sally Armitage... This is now the 3rd time I've driven over to Barrowford for the Podium 5k. The course is almost 5 laps of a totally flat cycle track. 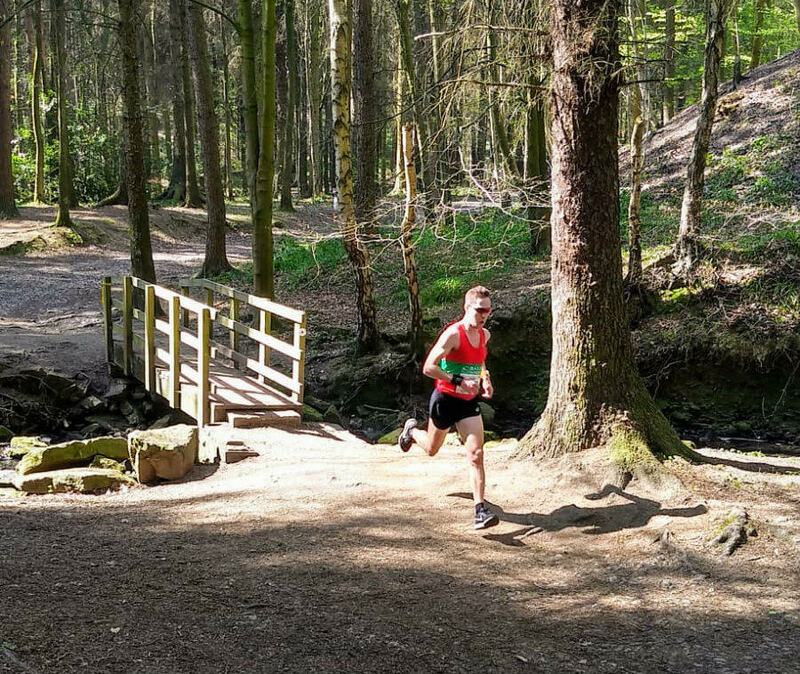 It's certainly the fastest 5k course within 20 miles of Ilkley and always attracts the fastest runners, with the first male of the 'A' race finishing in 14:42 and the first female finishing in 16:10.